Summer is the perfect time of year for outdoor entertaining on your beautiful deck, so why not accessorize with fun additions for your enjoying your outdoor space? Summer is the perfect time of year for outdoor entertaining on your beautiful deck, so why not accessorize with fun additions for your enjoying your outdoor space? If you’re looking to create a perfect outdoor oasis to host your guests throughout the warmer months, consider these great outdoor trends for your deck in 2018. Control your music and lights with smart tech such as smart light bulbs and Bluetooth sound systems to avoid a mess of wires around your deck over the summer. Many of these features can be conveniently controlled with your smartphone as you host parties or enjoy the deck with your family, so you never have to miss a beat with any summer event. Outdoor furniture doesn’t have to mean skipping out on comfort. Many new outdoor furniture sets now combine the best of both worlds with stylish waterproof cushions that can withstand rainy summer weather while also looking great on your deck as you entertain. 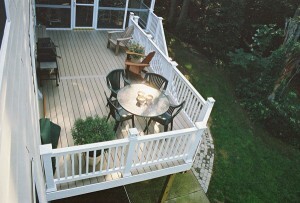 Add color and greenery to your deck with colorful planters to compliment the design of your deck. Plants and geometric planters are a perfect way to section off your deck into different spaces for enjoying your deck, such as seating and dining spaces for your guests. A firepit is a perfect accessory for your outdoor space, as it not only decorates your space but also adds a touch of fun to your deck. Have fun roasting marshmallows or sitting on your deck under the stars over the summer with a new firepit for your guests and family to enjoy. Create an outdoor dining space to enjoy meals on your deck, whether you’re grilling or bringing the fun of dinner outside for the evening. Designating a space to eat meals outdoors is a great way to expand your entertaining space with additional seating for any occasion, as your deck can instantly transform into a second kitchen or dining room.